Former NBA player Dennis Rodman landed in North Korea on Tuesday for at least his fourth visit to the country, saying he hopes to "open the door" for President Donald Trump. Rodman arrived in Pyongyang, where he was met by North Korean Vice Minister of Sports Son Kwang Ho, the Associated Press reported. "I'm just trying to open the door," Rodman told reporters. "My purpose is to actually to see if I can keep bringing sports to North Korea, so that’s the main thing." "I'm just here to see some friends and have a good time," added Rodman, who will stay in North Korea until Saturday. This trip marks at least Rodman's fourth visit to the communist state, three of which took place between 2013 and 2014, according to CNN. Rodman first met North Korean leader Kim Jong-un in February 2013 and traveled back in September of that year, when he held Kim's newborn daughter. A few months later, Rodman returned to the country in 2014 with a group of former NBA players for Kim's birthday. "Rodman arranged a basketball game with other former NBA players and North Koreans and regaled leader Kim with a rendition of ‘Happy Birthday,'" ABC News reported. Rodman tweeted Tuesday about his trip to North Korea and his sponsor, PotCoin.com. 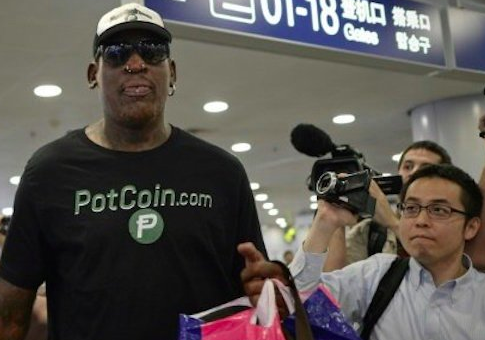 The former NBA player donned a "PotCoin.Com" tee-shirt during his arrival. "PotCoin was designed to empower, secure, and facilitate the legal cannabis community's transactions by creating a unique crypto currency for this thriving industry," according to the group's website. Rodman was asked if Trump was aware of his trip to North Korea before boarding his flight in Beijing to Pyongyang. "Well, I'm pretty sure he's pretty much happy with the fact that I'm over here trying to accomplish something that we both need," Rodman said. Rodman is a former contestant on Trump's reality television series "Celebrity Apprentice." The former NBA star told the media he does not plan on discussing Americans who are currently being held in North Korea. On the day that Rodman landed, North Korea released an American college student who had been detained there since early last year. Secretary of State Rex Tillerson announced Ottom Warmbier's release on Tuesday morning. This entry was posted in National Security and tagged Dennis Rodman, Kim Jong Un, North Korea. Bookmark the permalink.